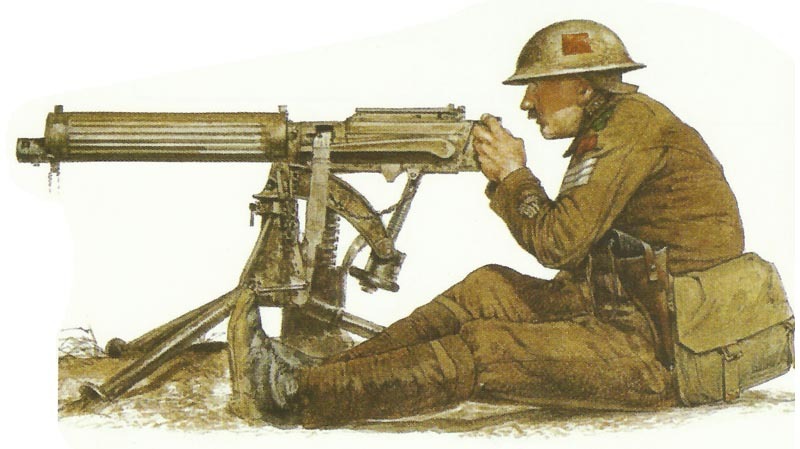 A sergant of the British Machine Gun Corps uses his Vickers machine-gun at close range. He is armed with a revolver, and on his arm is the machine-gun proficiency badge, awarded only to skilful machine-gunners. British Machine Gun Corps formed: MGs taken from battalions from overseas and formed into company’s with each brigade during November. Training Centre for the Machine Gun Corps is at Grantham, England. Galicia: Ivanov captures 3,000 PoWs on river Strypa, takes Visniovtchyk following day, then driven back over Strypa but then checks Austrians on October 13-14. Bulgars attack Serbs from Belogradchik in frontier incident, but driven off south of Zajecar following day. Britain: Dardan­elles committee decides to send strong force to Egypt ‘without prejudice to its ultimate destination’. Dardanelles: After telling Dardanelles Comittee ‘that abandonment would be the most disastrous event in the history of the Empire’ Kitchener cables Hamilton for cost of evacuation, replies following day impossible then 50% losses. Armenia: Turks repulsed at Ichkau; Van Pass and at Arkhava on coast (October 12). Baltic: 3 Royal Navy submarines sink 14 German iron-ore steamers coming from Sweden (until October 19) and a German torpedo boat on October 14, forcing German patrol craft reinforcements from North Sea, but Baltic C-in-C Prince Henry rejects convoy system. 6 Russian submarines in Gulf of Bothnia take 2 prizes out of 24 ships. Italy: Chief of Naval Staff Admiral Revel resigns to become C-in-C Venice (until February 1917), not replaced instead a Sub-Chief appointed.